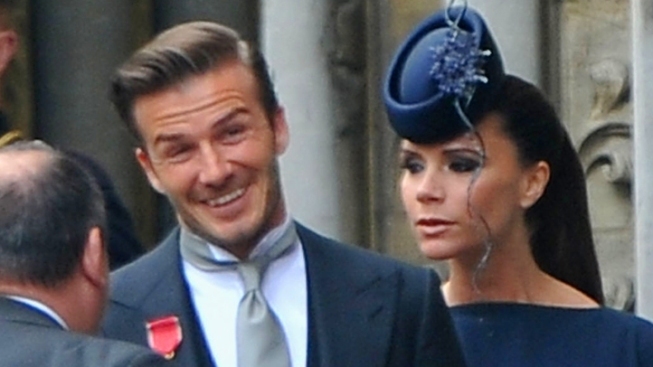 David and Victoria Beckham were already eagerly expecting their first daughter, born July 10, when they attended the royal wedding back in April. Victoria and David Beckham's three sons finally have a little sister—and their fashionista mom finally has somebody for whom to design tiny dresses. The former Spice Girl gave birth at Cedars-Sinai Medical Center in Los Angeles at 7:55 a.m. Sunday morning with her soccer-playing husband by her side. The baby was a healthy seven pounds, 10 ounces. The transatlantic celebrity parents didn't announce a name, but they'd known for months what color to paint the nursery. They also knew to expect the baby any day now; its due date was July 4. The couple, regular tabloid fixtures in both the U.S. and their native England, already has three children: 12-year-old Brooklyn, eight-year-old Romeo and six-year-old Cruz. "Obviously, having three boys, you kind of expect another one, so finding out a little girl is in there is surprising," David Beckham said excitedly soon after announcing his wife's pregnancy months ago. The star footballer has recently been leading the L.A. Galaxy on a long undefeated streak, the Associated Press reported. His wife has kept busy even toward the end of her pregnancy, preparing the launch of her new dress line, Victoria by Victoria Beckham, which hits stores next year. "This is the most girly collection I’ve ever created," she told Women's Wear Daily last month—and it seems fitting. Think any of those dresses come in infant sizes?